While we'll maintain our stance that his sensibilities don't always align with ours, Chef Tom's, or the spirit of the challenges, we're going to eat whatever detrimental words we've said about the "cheftestant" from Lodi. Because, perhaps appropriately in the "Seven Deadly Sins" challenge episode, Mikey proved beyond a shadow of a doubt that he deserved to be there. That Ilan's confidence in the prior 'dinnner party' challenge, where they partnered up, was justified. That, dare we say it, . Friends, that boy can cook. Seven chefs are left, and many of them seem to hate Marcel. Betty and Ilan in particular heretofore; Sam joins in during this episode. Cliff seems more diplomatic, though the distaste is clear. Mikey is either above it all or too zonked on his painkillers (emergency dental surgery) to participate in the Marcel bashing. Elia, who's happy to still be around after last week, is friendly with Marcel (we're pretty sure they mentioned working together before? ), but seems to understand why he might rub the others the wrong way. As there aren't many contestants left, the Quickfire Challenge no longer provides protection from elimination, much to Mikey's chagrin -- he feels like crap, and wanted to win this, then skip the big challenge altogether as to convalesce. No such luck with this rule change. The challenge: every cheftestant is assigned a color with which to focus a dish around as a theme. Ted from Queer Eye is the guest judge, standing in for Gail. While we don't usually go into such detail for the Quickfire, this was super interesting . 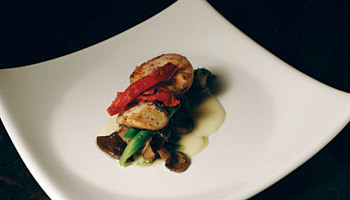 . .
image from Bravo's Top Chef site; Rate the Plate! First up, the cops. After the fracas, they detained four of the assailants but let them go. As of right now, nobody has been arrested as police are saying they're still collecting evidence.